Azure, a horseshoe Argent, heels to base, surmounted of a cross pattee of the last. Atop the cross a raven, wings expanded and inverted all proper, holding in its beak a ring Or. 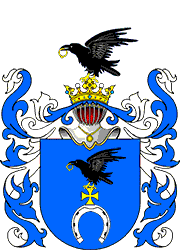 For a crest out of a ducal coronet a raven holding a ring in its beak, as in the shield. When one of the family of Korvin had the good fortune to marry a daughter, an only child, of the Pobog clan, he redesigned the arms by adding to the Horseshoe his ancestral Raven with a Ring. This Korvin came to Poland from Hungary, seeking knightly glory. In Hungary the family of Korvin had proliferated, descending from one of the Roman Corvini. *) Marcus Valerius Corvus, 371—271 BC. Niesiecki K., "Herbarz Polski" S.J., Lipsk 1839-46.